Even if you consider yourself interested in cocktails, how deep is your home liquor selection, really? My bar cart has nice bottles of the stuff I like—gin, aged rum, fernet, a few types of whiskey, armagnac from a trip to France—and standards like vodka, white rum, and tequila to round those out. So when I flip through most “serious” cocktail recipe books, it’s wishful thinking. I’d need a bottle of Amaro Nonino for that drink, I sigh, or a bottle of Creme Yvette for that recipe. To make just a handful of drinks, I’d easily set myself back a few hundred dollars. Author Maggie Hoffman felt my pain. She founded Serious Eats’ drinks section, so though she herself has a liquor collection that nearly anyone would drool over—a bar cart plus two closets of liquor, including deep selections of gin, whiskey, and Spanish and French amari—she still hit a wall when trying to execute certain cocktail recipes. The result is The One-Bottle Cocktail, out March 6, featuring more than 80 recipes each using just a single spirit: vodka, gin, brandy, whiskey, tequila/mezcal, or rum. The recipes come from big names in the bar world—bartenders at Death & Co., Ox, Amor y Amargo, Hale Pele—and though they’re relatively simple to make, their flavors are modern and sophisticated. Complexity comes not from liquors but from herbs, fruit, syrups, tea, honey, yogurt, horseradish, soy sauce, coffee, and other relatively easy-to-find pantry items. So, how much better are these recipes than mixing gin into your LaCroix? Much better. I spent last weekend working through a handful of recipes in this book, and I only had to pick up about $15 worth of groceries to make them—$7 of which was spent on fancy orange marmalade. This book would be ideal in the spring and summer, when fresh produce would make all the difference in some of the fruit- and herb-heavy cocktails. But even in February, I was able to find the produce I needed. One of the best inclusions in this book is the “Bonus Drinks” section at the end of each spirit’s chapter: If you really like rum, for example, this page lists which other recipes in the book could be made by substituting rum in for the base spirit. Hoffman says she “regretted it” when writing the book because of all the extra effort it took to recreate each drink with five other spirits, but I think it’s invaluable, essentially doubling the number of cocktails in each chapter. When I first picked up this book, I thought it was a clever premise but wouldn’t yield drinks much more flavorful than a standard gin and tonic or vodka-lemonade. I was so wrong. It’s a worthy buy for home bartenders just starting out as well as those who consider themselves operating at a 201 level. Many of the recipes are simple enough to memorize, riff on, adapt, and make your own—I can’t wait to shake and stir my way through the rest of the pages. Maggie Hoffman: I adore this fragrant and refreshing strawberry-gin drink, created by Shannon Tebay Sidle of New York’s Slowly Shirley and Death & Co. The secret ingredient is a dollop of unsweetened Greek yogurt, which gives the cocktail a tangy flavor and subtly creamy texture. The final result isn’t sweet or smoothie-like; this is definitely still a cocktail. A sprinkle of freshly ground black pepper highlights the gin’s herbal character, but I also like this drink with grassy blanco tequila or a full-bodied aged rum. If your fridge doesn’t dispense crushed ice, fill a freezer bag with cubes, wrap them in a dish towel, and go wild with a meat tenderizer or rolling pin. 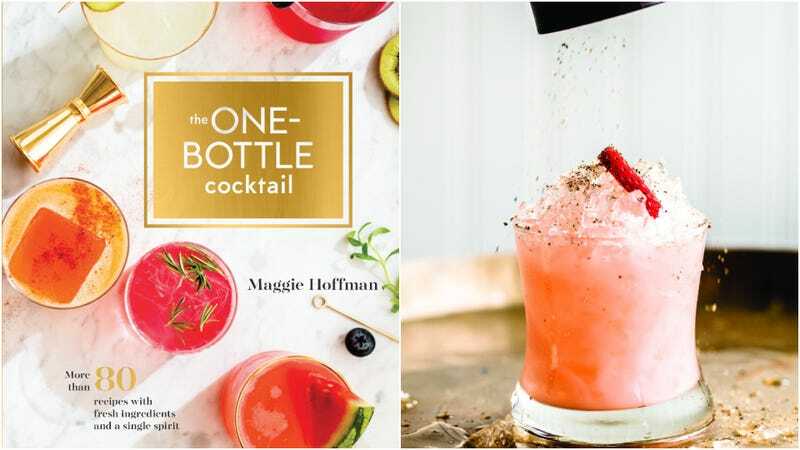 Reprinted with permission from The One-Bottle Cocktail: More than 80 Recipes with Fresh Ingredients and a Single Spirit by Maggie Hoffman, copyright 2018. Published by Ten Speed Press, an imprint of Penguin Random House.